Shopping for new or replacement patio doors? Choosing from the many options can be overwhelming. Plus, too many companies will try to push their most expensive products without focusing on what is most important to homeowners: beauty, quality, and efficiency. At Brock Doors & Windows, we know how important it is to Toronto residents to have high quality, affordable patio doors; after all, these things are important to our families, so we want to be sure to offer such benefits to yours! More and more, homeowners across the Toronto area are specifically choosing vinyl patio doors in Toronto, ON over other materials for their unique benefits. We want you to be in-the-know as you choose the perfect patio door for your home, so our team at Brock Doors & Windows has put together a list of benefits just for you! Patio doors typically occupy a large portion of a main wall in the home. This means there is ample opportunity for heat or air conditioning loss and an increase in utility cost each month. 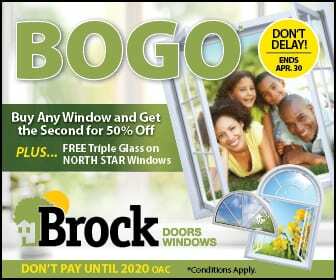 Brock features North Star Patio Doors which are top of the line in energy efficiency. These vinyl doors stand up to the elements without peeling, flaking, rotting, warping, etc. They are air-tight and supremely manufactured. As mentioned before, vinyl will not degrade due to the elements (even the cold Canada winters we experience!). This is a huge selling-point for homeowners looking to replace their outdated patio doors. And why shouldn’t it be? The less time you have to spend maintaining your home, the more time you have to enjoy life. Further, vinyl will never need to be repainted or re-stained—which saves you time and money over the years. Should your vinyl patio doors become dirty, rub with a damp cloth and they will be good as new! Ask us about our environmentally friendly options—we proudly offer customizations to further shrink your carbon footprint!At Brock, we love to show clients the different glass coatings which help keep you comfortable throughout the long Toronto winters and warm summers. In fact, these glass coatings reflect heat in the direction they were sourced: back to the sun or back to the furnace! Don’t worry; this option is nearly invisible. You will not need to compromise on lighting to be good to the environment. Vinyl is inherently soundproof—more so than wood or aluminum. How nice will it be to have a patio door which provides a barrier between “indoor voices” and “outdoor voices?” Suddenly, parents all across Toronto cheer… Truly, this is a benefit we all can appreciate (parents or not). Live in a noisy neighborhood? Near a school? Downtown or near a hospital? Vinyl patio doors are for you. Come visit us at Brock Doors & Windows and see for yourself why your neighbors are choosing our vinyl patio doors for their Toronto homes.